Exclusively at Disney’s D23 Expo August 9–11 at the Anaheim Convention Center, Disney fans are invited to explore the incredible roster of film, stage, and music projects on the horizon at The Walt Disney Studios, with a variety of panel discussions, sneak peeks, and exhibits. This year the Studio will present two arena shows, kicking off the Expo at 10 a.m. Friday, August 9, with “Art and Imagination: Animation at The Walt Disney Studios,” a showcase of upcoming animated films from Walt Disney Animation Studios, Pixar Animation Studios, and DisneyToon Studios. John Lasseter, Chief Creative Officer of Disney’s Animation Studios, will host a lively exhibition chock-full of never-before-seen footage, celebrity and filmmaker appearances, and live performances from films like Disney’s Frozen, Pixar’s The Good Dinosaur and the Mickey Mouse short Get a Horse! Then at 10:30 a.m. Saturday, August 10, Walt Disney Studios Chairman Alan Horn, Disney Live Action Production President Sean Bailey, and Marvel Studios President and Producer Kevin Feige will host “Let the Adventures Begin: Live Action at The Walt Disney Studios,” an expedition through the Studio’s exciting live-action offerings from Disney as well as several powerhouse pictures on tap from Marvel Studios, with exclusive clips and surprise guests from a range of films including Saving Mr. Banks, Tomorrowland, Thor: The Dark World, Captain America: The Winter Soldier and much more. BURBANK, Calif. – July 29, 2013 – Exclusively at Disney’s D23 Expo August 9–11 at the Anaheim Convention Center, Disney fans are invited to explore the incredible roster of film, stage, and music projects on the horizon at The Walt Disney Studios, with a variety of panel discussions, sneak peeks, and exhibits. This year the Studio will present two arena shows, kicking off the Expo at 10 a.m. Friday, August 9, with “Art and Imagination: Animation at The Walt Disney Studios,” a showcase of upcoming animated films from Walt Disney Animation Studios, Pixar Animation Studios, and DisneyToon Studios. John Lasseter, Chief Creative Officer of Disney’s Animation Studios, will host a lively exhibition chock-full of never-before-seen footage, celebrity and filmmaker appearances, and live performances from films like Disney’s Frozen, Pixar’s The Good Dinosaur and the Mickey Mouse short Get a Horse!. Then at 10:30 a.m. Saturday, August 10, Walt Disney Studios Chairman Alan Horn, Disney Live Action Production President Sean Bailey, and Marvel Studios President and Producer Kevin Feige will host “Let the Adventures Begin: Live Action at The Walt Disney Studios,” an expedition through the Studio’s exciting live-action offerings from Disney as well as several powerhouse pictures on tap from Marvel Studios, with exclusive clips and surprise guests from a range of films including Saving Mr. Banks, Tomorrowland, Thor: The Dark World, Captain America: The Winter Soldier and much more. Fans can expect appearances from Kristen Bell and Idina Menzel (Frozen), Dane Cook (Disney’s Planes), Jason Schwartzman and B.J. Novak (Saving Mr. Banks), Ty Burrell (Muppets Most Wanted) and top Marvel and Disney•Pixar talent. And in typical D23 Expo fashion, fans can also anticipate surprise appearances from more of their favorite stars. In “Broadway & Beyond…Celebrating the Stars of Disney on Broadway,” Friday, August 9 at 6:30 p.m., audiences will take a musical journey with Disney Theatrical Productions President Thomas Schumacher and a bevy of stage stars, including Heidi Blickenstaff (The Little Mermaid), Ashley Brown (Mary Poppins, Beauty and the Beast), Merle Dandridge (Tarzan® and AIDA), Josh Strickland (Tarzan) and Alton Fitzgerald White (The Lion King), who sing beloved songs from the award-winning musicals they starred in as well as classic tunes from the Disney on Broadway catalog. Music fans will be treated to performances by Good Luck Charlie star and platinum-selling Hollywood Records artist Bridgit Mendler, and Hollywood Records artists R5, fronted by Teen Beach Movie and Austin & Ally star Ross Lynch. D23 will also present Richard Sherman and Alan Menken, two of the world’s most celebrated songwriters and composers who have won a combined 10 Academy Awards for their work with Disney. In addition, Grammy® Award-winning producer and resident Disney Music Historian, Randy Thornton, will take fans on a musical journey with inside stories of songs written for classic Disney films. Walt Disney Animation Studios Pavilion – Attendees can summon their inner artist and escape into diverse worlds of where there’s much to explore, from the stunning snow-covered setting of Frozen to the high-tech, action-packed world of Big Hero 6, featuring the latest animation technology, sneak peeks, and giveaways. Disneytoon Studios Pavilion – Aviation aficionados and fairy fans will be on cloud nine as they explore projects including Disney’s Planes and immerse themselves in the world of Pixie Hollow and the magical heroines from Disney’s Fairies with exciting demonstrations and presentations. Walt Disney Studios In-Home Entertainment Zones – Dive into cutting-edge home entertainment technology and learn what the future holds for Disney movie fans, with sneak peeks of upcoming films in breathtaking high-definition Blu-ray 3D™, including new hit films and new-to-Blu classics, the latest on Disney Second Screen and more. Also, the adorable Disney “Buddies” are back with an all-new movie—Super Buddies—coming August 27! Fans can get a picture with one of the real puppy super heroes. They are appearing live at D23 Expo for the first time—Saturday and Sunday! Tickets for the D23 Expo are $57 for a one-day adult admission and $47 for children 3–12. Tickets for members of D23: The Official Disney Fan Club are $50 for a one-day adult admission and $42 for children. Multi-day money-saving tickets are also available for both D23 Members and the general public, and D23 Members can save as much as $84 off the price of admission, based on the purchase of four three-day tickets at the D23 Member rate. 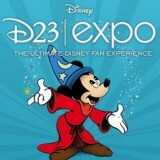 For more information on tickets and the ticket pricing structure for members and general admission, visit D23Expo.com. The D23 Expo—The Ultimate Disney Fan Event—brings the entire world of Disney under one roof, providing attendees with unprecedented access to Disney films, television, and theme parks. For the latest D23 Expo 2013 news, visitD23Expo.com. To be part of the D23 Expo conversation, make sure to follow @DisneyD23 and tag your tweets with #D23Expo. The name “D23” pays homage to the exciting journey that began in 1923 when Walt Disney opened his fledgling studio in Hollywood. D23 is the first official club for fans in Disney’s nearly 90-year history. D23 gives its members a greater connection to the entire world of Disney by placing them in the middle of the magic through its quarterly publication Disney twenty-three; a rich website at D23.com with members-only content; and member-exclusive discounts and special events for D23 Members throughout the year, highlighted by the D23 Expo in Anaheim, California, August 9–11, 2013.